ZipBooks lets you tag your transactions with searchable keywords in order to easily find them later and create reports based on those tags. 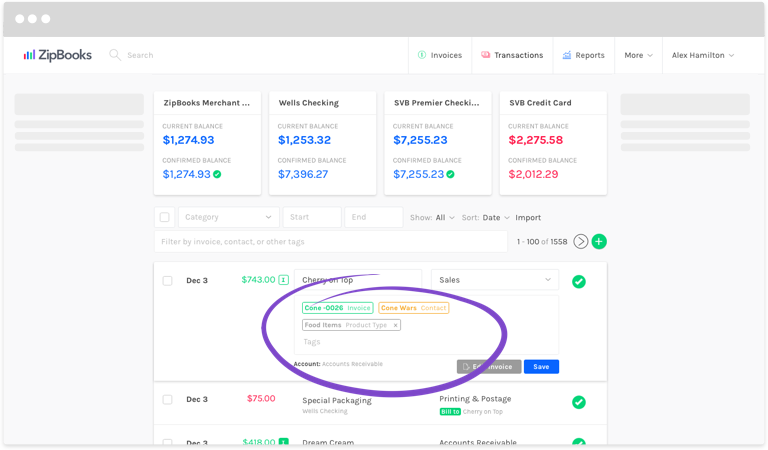 Tag by customer or vendor, or tag all transactions that are related to specific store locations, product lines, or wholesale and retail channels so that you’re sure to keep on top of expenses, sales, or other transactions related to each area. If you’re looking for an existing transaction, find it, and click on it. Click in the Tag field and start typing in the name of the tag. Add as many as you’d like. You can tag by customers, vendors, or invoice numbers that exist in your ZipBooks account. Or you can choose to create custom tags. Now that transaction will be included when you run reports on the tags you used. You can also bulk tag transactions to save time! In your transactions list, click on the check boxes to left of each transaction you want to tag. At the top of your transaction list, type the name of your tag in the Add tag to selected field. Add as many tags to each group of transactions as you need!